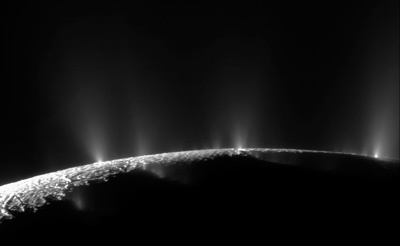 Scientists on NASA's Cassini mission have identified 101 distinct geysers erupting on Saturn's small, icy moon Enceladus and uncovered critical clues to what powers them. Their results, including the possibility that liquid water may be reaching all the way to the surface, are presented in two back-to-back articles published today in the Astronomical Journal. Francis Nimmo, professor of Earth and planetary sciences at UC Santa Cruz, performed geophysical modeling for the study and is lead author of the second paper. Over a period of 6.5 years, Cassini's cameras surveyed the south polar terrain of Enceladus. The unique geological basin at the south pole is renowned for its four prominent "tiger stripe fractures" and the geysers of tiny icy particles and water vapor first sighted there nearly 10 years ago. The result of the survey is a map of a hundred geysers, each erupting from one of the tiger stripe fractures, and the discovery that individual geysers are coincident with small hot spots. In addition, the researchers found that the greatest geyser activity occurs where the stresses across the surface due to tides raised on the moon by Saturn are greatest. These relationships pointed the way to the geysers' origin. After the discovery of the geysers in 2005, scientists suspected that repeated flexing of Enceladus by Saturn's tides as the moon orbits the planet had something to do with their behavior. One suggestion included the rubbing back-and-forth of opposing walls of the tiger stripe fractures generating frictional heat that turned ice into geyser-forming vapor and liquid. An alternate view held that the opening and closing of the fractures allowed water vapor from below to reach the surface. But before the new study, it was not clear which process was the dominating influence. Nor was it certain whether or not excess heat emitted by Enceladus was everywhere correlated with geyser activity. To locate the sources of the geysers, the researchers employed the same process of triangulation used historically to survey earthly geological features, like mountains. When the authors compared the geysers' locations with low-resolution maps of thermal emission, it became apparent that the greatest geyser activity coincided with the greatest thermal radiation. Comparisons between geysering and tidal stresses revealed similar connections. But these correlations alone were insufficient to answer the all-important question: What produces what? Does friction create the geysers, making them the signatures of the heating process? Or do tides merely open up cracks to the sea below, allowing water vapor and liquid to reach the surface? In the latter case, the heat observed must be the component that is released when the geyser’s vapor condenses and liquid freezes on the near-surface fracture walls as the material vents to space. The answer to this mystery came from comparison of the survey results with high-resolution data collected in 2010 by Cassini's heat-sensing instruments. Individual geysers were found to coincide with small-scale hot spots, only a few dozen feet (or tens of meters) across—too small to be produced by frictional heating, but the right size to be the result of condensation. This immediately implicated the hot spots as the signature of the geysering process. "Once we had these results in hand we knew right away that heat was not causing the geysers but vice versa," said Carolyn Porco, leader of the Cassini imaging team from Space Science Institute in Boulder, Colorado, and lead author on the first paper. "It also told us the geysers are not a near-surface phenomenon but have much deeper roots." The authors concluded that the only plausible source of the material forming the geysers is the sea now known to exist beneath the ice shell thanks to recent analysis of Cassini gravity data. In the companion paper, the authors report that the brightness of the plume formed by all the geysers, as seen with Cassini's high resolution cameras, changes periodically as Enceladus orbits Saturn. Armed with the conclusion that the opening and closing of the fractures modulates the venting, the authors compared the observations with the expected venting schedule due to tides. The result: the simplest model of tidal flexing provides a good match for the brightness variations Cassini observes, but it does not predict the time when the plume begins to brighten. Some other important effect is present. "It's an interesting puzzle, said Nimmo, a participating scientist in the Cassini program. "Possibilities for the mismatch include, among other effects, a delay in the response of the ice shell, which would suggest tides are heating the bulk of the ice at the south pole, or subtle changes in the spin rate of Enceladus." The possibility of a slight change in spin rate is of great importance, as it could indicate that the liquid water layer on Enceladus, though thicker under the south polar province of the moon, is global. That would make the internal structure of Enceladus similar to that of the Jovian moon, Europa, which is also believed to have a global ocean. An additional outcome of the research is the possibility that seawater may reach all the way up to the surface, not just as droplets entrained in vapor but as a liquid. The fact that Enceladus’ sea is salty, laced with organic compounds, spouting into space, and maybe even rising up to the surface has raised this particular Saturnian moon as a major target for future exploration. "For me, the finding of an easily sampled, habitable environment within Enceladus has been Cassini's most profound discovery," said Porco. "Many of us are now asking whether a second origin of life in our solar system could have occurred on this little moon." Accurate planning for future missions requires understanding the details of the moon’s geological activity. Consequently, continued imaging observations of the time-variability of Enceladus' plume and thermal measurements of its geyser basin are major goals for the rest of the Cassini mission. More information about Cassini is available at www.nasa.gov/cassini and saturn.jpl.nasa.gov. The Cassini-Huygens mission is a cooperative project of NASA, the European Space Agency and the Italian Space Agency. The Jet Propulsion Laboratory (JPL), a division of the California Institute of Technology in Pasadena, manages the Cassini-Huygens mission for NASA's Science Mission Directorate, Washington. The Cassini orbiter and its two onboard cameras were designed, developed and assembled at JPL. The imaging team consists of scientists from the U.S., England, France, and Germany. The imaging team is based at the Space Science Institute in Boulder, Co.